Are you brave enough? Come see our amazing nature in the Colombian Andes! Sea un cultivador en nuestro eco lodge! Ayúdanos con reparos generales en Boca de Sabalos, Nicaragua! Ayúdanos con mantenimiento y limpieza en Boca de Sabalos, Nicaragua! Permaculture is a system of social, agricultural, and cultural principles intended to create sustainable and self-sufficient communities and preserve the environment. Permaculture depends upon seven principles: land and nature stewardship, built environment, tools and technology, culture and education, health and spiritual well-being, finances and economics, and community governance. 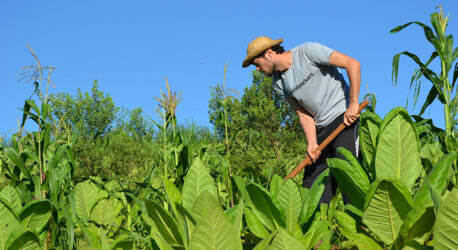 You can learn permaculture by becoming a volunteer at conservation institutes, organic farms, or eco villages. Being part of an Eco Project is a great opportunity to stay close to nature and grow as a person. That's why organic farming is one the most searched-for opportunities among travelers looking to do volunteer trips abroad. This kind of experience is only made possible thanks to a deep sense of collaboration between hosts and volunteers. So, remember to show your willingness to help your host out and be part of this community. Get ready to get your hands dirty!